Identification keys and general biology are given in Nielsen (1932), Spradbery (1973), Felton (unpublished), Richards (1980) and Yeo & Corbet (1995). Throughout England and Wales including the Isle of Man, Lundy Island, Isles of Scilly and into Scotland north to Aviemore (Moray) and Aberdeen. Not found in Ireland. There are some old records from the Channel Islands. Overseas, found in many parts of mainland Europe (Norway, Sweden, Finland, Denmark, The Netherlands, France, Spain, Germany, Italy, Poland, Austria, Armenia), North Africa (Morocco) and Asia (Iran, Turkestan, Manchuria, but not Japan). The species is not regarded as being scarce or threatened. The distinctive deep v shaped notch in the keel at the front of gastral tergite 1 is arrowed. This feature is diagnostic for separating A. parietum from all other Britsh Ancistrocerus species. Found in a wide variety of habitats including sandy and clay soils, river banks, coastal areas and open urban, parkland and wooded areas. Probably univoltine; mainly during June, July and August, sometimes in May and September, and rarely in October. In late spring, males and females emerge from over-wintering sites and mate. The females then search for nest sites. They are tube-dwellers generally using hollow cavities in plants. Their cells are arranged linearly and separated by clay partitions. 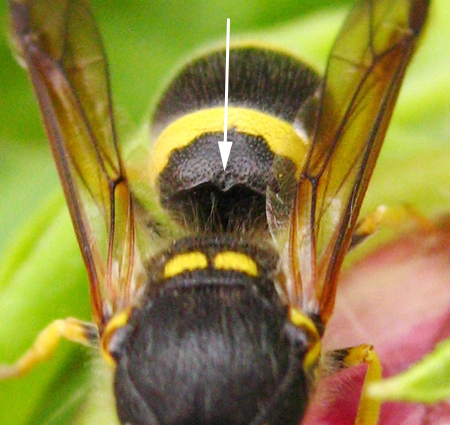 The wasps use a wide range of nesting sites, including pith cavities of bramble and elder, straw of thatched roofs, holes in walls and masonry, the angle between a bookcase and window ledge, disused burrows of wood-boring insects, a disused embryo nest of the social wasp Vespula vulgaris (Linnaeus), and a disused nest of a mason wasp, Odynerus species. The female clears away debris and pith from the tube or hole and usually plugs the inner end with clay which has been softened with water. Female cells are larger than male cells and built first at the inner end. When a cell is completed an egg is laid and then several paralysed caterpillars are forced into the cell. The cell is then sealed with another clay partition. Usually a clear vestibular space separates the outermost cells from the closing clay plug. Sea-holly, bramble, hogweed and thistles. Female Chrysis ignita (Linnaeus) enter provisioned cells to lay their eggs. They are also recorded as tearing down a clay partition to gain access to a cell (Morgan, 1984).